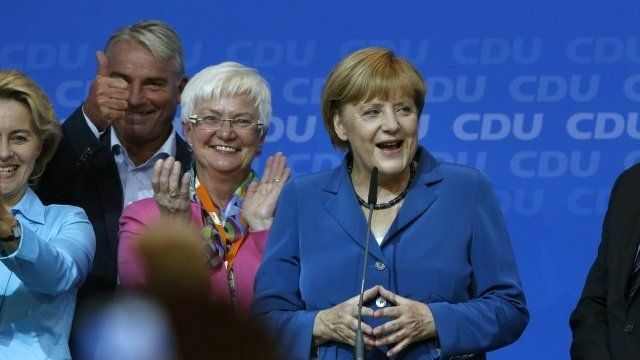 Merkel celebrates 'superb result' Jump to media player Angela Merkel has urged her party to celebrate "a superb result" after exit polls suggested she was set to win a third term as German chancellor. Angela Merkel has urged her party to celebrate "a superb result" after exit polls suggested she was set to win a third term as German chancellor. Her Christian Democrats took about 42% of the vote, according to exit polls. But Mrs Merkel's preferred coalition is at risk, as her Free Democrat partners appear not have secured the 5% needed to enter parliament. She may, therefore, be forced to seek a grand coalition with the Social Democrats - estimated to have won 26%.